We specialize in complete website packages for businesses, churches, homeowner associations and other organizations. We can create sites with only a few pages or full featured sites based on your requirements, or anything in between. We also offer full managed hosting, so with us you can get a complete package with no technical knowledge required whatsoever. Our services are affordable, and we do not compromize on quality. Please Contact Us with your website needs and ideas, and we will get back to you with our input, suggestions and quotes. Even if you don't sell online, you are losing business if you don't have a website. Our prices are affordable and we'll make your business shine online. 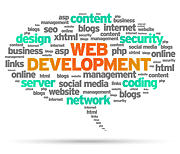 Your website is your organization and communication tool. Manage documents, events, members, and much more. We'll customize to fit your needs. We offer reliable and inexpensive hosting from only $9.95 per month. Please contact us with your web site details and we will customize a hosting package to your needs. We host a large variety of business websites, and 90% are on our $9.95/month plan. Chances are that it will be sufficient for your site as well. We specialize in website development for businesses, churches, homeowner associations and other organizations. We also offer hosting, so with us you can get a complete package with no technical knowledge required whatsoever. We offer reliable and inexpensive VPS hosting from only $9.95 per month. The layout of websites for Restaurants can vary a lot depending on the type of restaurant and your own visions about your online presence. As a minimum you will want a menu, a few images and a map with directions. This can be done as a simple 2 page static site. However, your website visitors may not yet have decided where to go for dinner and visiting your restaurant website is a part of the decision process. When they see your site they should see images of that delicious food so it will make them drool. They should read about the owners/employees passion for their food, and they should see some great looking images from your restaurant. Let's throw in a couple of 5 star review quotes and your guests are on the way. On the backend of the system we can make an easy to update menu and if your restaurant takes table reservations, then we can handle that as well. Please use the contact form and let us know what you have in mind for your new restaurant website. It's always a good idea to have your own website for your rental property. The big rental sites like FlipKey or VRBO are way too restrictive and charge huge fees to both you and the renter. It's a win/win situation to rent direct to your vacation guests through your own site. I personally own a vacation rental property, so I know what is needed on a site for it to be successful, that be SEO or functionality. I specifically mention the lawn care businesses here, because I see a lot of lawn care businesses with no online presence at all. In today's world the customer expect to find a website with a business representation. The website should as a very minimum describe what you are doing and have a contact form and other contact information. The perfect lawn care website will also describe your different services in details and give the visitor options for online payment. Payment in cash or by check while you are there may work best for you, but it is very inconvenient for your customer. For your new potential customer there should also be an option for a quote request based on his need. You are seriously losing out to your competitors if these simple things aren't in place. Don't wait any longer. Go to our contact form and let us know what we can do for you. I strongly believe you will be surprised how affordable it can be done. Nothing of what is mentioned above is complicated to do and your new full featured website can be up and running in short time. 1. Simple and static 2 or 3 page website to represent your company online. This is a very inexpensive solution, but it does not provide your potential customers to view properties on your site. 2. Same solution as above but properties can be added and managed manually. Please note that there is a separate charge for access to IDX/MLS. The perfect HOA website represent your homes and your area to the world outside. This is the first impression for potential residents, renters and buyers. This should also be the place to go and download documents and find detailed information about your homeowner's organization. This is also a convenience and a timesaver for the HOA management as well as the residents. Board meeting agendas and minutes should be easily manageable for the management and downloadable for the residents. Resident's subscriptions make it easy for the management to communicate notices and news directly to the residents email inbox. Please use the contact form and let us know what you are looking for in your new HOA website.